INNOVATE 2017 is the UK’s leading innovation event. It brings the brightest and boldest of UK innovators together to share, excite, and inspire businesses, individuals and governments to tackle the challenges of tomorrow. Ortelio was invited as one of the UK’s most innovative companies to present MARIO robot and NOOS cloud technology. 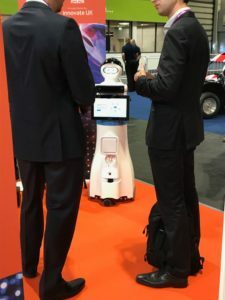 NOOS is a revolutionary service, providing centralised intelligence to robots that are connected to it. Noos is a highly scalable service, which greatly reduces development and deployment costs.